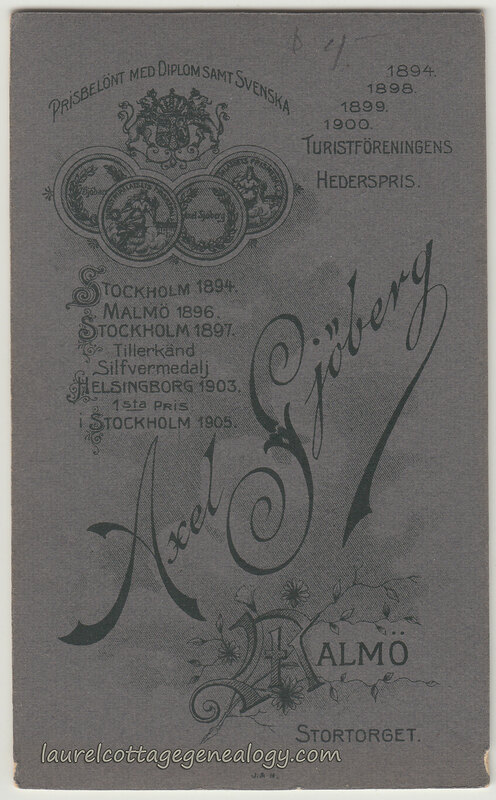 Above, the reverse side of the CDV from the prior post for photographer Axel Sjöberg. In looking online for biographical info for this photographer, we found other CDVs, Cabinet Cards from the 1880s, verification of some of his awards mentioned in various publications of Svenska turistföreningens årsskrift (Swedish Tourist’s Association Yearbook) and a grateful acknowledgement to Sjöberg (among others) from author William Widgery Thomas, Jr. in Sweden and the Swedes (1893) for the use of his landscape photos, “…especially along the Göta Canal.” Check out the illustrations and other artwork in the eBook, and it looks like great reading (Now, where to find the time? 😉 ) The book was also published in Swedish. From the website KulterNav: The full name for the photographer was Per Axel Sjöberg, born June 15, 1865 in Södertälje, Södertälje kommun, Stockholms län (Södertälje, Stockholm County, Sweden). He died July 19, 1936 in Skåne län (Skåne County, Sweden). Then, a Household Clerical Survey record confirming name, date of birth and occupation, recorded that he’d moved in 1887 from Södertelge to Karlsborgs garnisonsförsamling, (parish) in Skaraborg County. And the online death record showed his place of death as Malmö, Skåne County, Sweden. William W. Thomas, Jr. n.d. https://en.wikipedia.org/wiki/William_W._Thomas,_Jr. (accessed September 4, 2016). Thomas, William W. Sweden and the Swedes. Chicago: Rand, McNally & Company, 1893. (Google eBook). Thomas, William W. Sverige och Svenskarne: eller Från Slott till Koja. Chicago: Swedish Publishing Company, 1901. (Google eBook). Biographies, Axel Sjöberg (1865-1936). Moderna Museet. (accessed September 4, 2016). 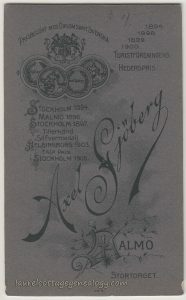 “Sjöberg, Axel (1865 – 1936) [sv]” KulterNav. (accessed September 4, 2016). Roll/Fiche Number: GO-550; Volume Number: AI:38; Page Number: 93. Ancestry.com. Sweden, Selected Indexed Household Clerical Surveys, 1880-1893. Swedish Church Records Archive. Johanneshov, Sweden: Genline AB. Ancestry.com. Sweden, Selected Indexed Death Records, 1840-1860 and 1878-1942. Allen, Frank W. 83 Michigan ave.
Bardwell, J.J. 120 Michigan ave.
Bradford, H.J. 257 Michigan ave.
Campbell, S.W. 134 Gratiot ave.
DeForest, D. A. 1 Larned w.
Forster, J.T. & Son, 180 Gratiot ave.
Hadstate, H.C. 227 Jefferson ave.
Hunter Bros, 131 and 133 Michigan ave.
Leonard, C.W. 231 Jefferson ave.
Levy, Charles 175 Woodward ave.
Lutge, Frederick 53 Monroe ave.
Marratt’s City Hall Photographic Gallery 131, 133 and 135 Woodward ave.
Randall, C.C. 220 Woodward ave.
Simonds, J.S. 149 Jefferson ave.
Taylor & Taylor 244 Woodward ave.
Tromblay, E.E. 59 Monroe ave.
Watson, J.E. 41 and 43 Monroe ave. This list of 22 photographers is from the Detroit City Directory for 1880, and includes their business addresses. The use of the small a for avenue or the small w for west, seems to have been the way it was done back then, as this has been noted in other directories, newspaper articles, etc. I found this list while researching Charles Millard, and just thought it was interesting, and that it may come in handy for someone searching for an 1880’s era Detroit photographer. Just as an aside, and by contrast to the number of photographers above, the next category is physicians, and that list holds 220 entries.